By Ronan Farrow. An exploration of the collapse of American diplomacy and the abdication of global leadership, by the winner of the 2018 Pulitzer Prize in Public Service. Illuminates one of the most consequential and poorly understood changes in American history. 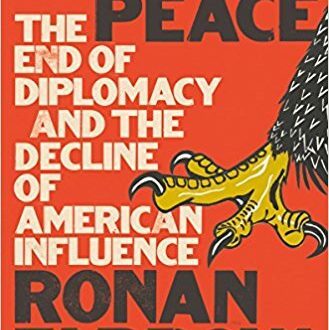 Provides a personal look at some of the last standard bearers of traditional statecraft, including Richard Holbrooke, who made peace in Bosnia and died while trying to do so in Afghanistan. Drawing on newly unearthed documents, and richly informed by rare interviews with warlords, whistle-blowers, and policymakers―including every living former secretary of state from Henry Kissinger to Hillary Clinton to Rex Tillerson―makes a powerful case for an endangered profession. Diplomacy, it argues, has declined after decades of political cowardice, shortsightedness, and outright malice―but it may just offer America a way out of a world at war. Read more.